These past six days have delivered blow after blow, and I am afraid that this little guy has gotten the worst of it. We got the disappointing news yesterday that he will need switch to the 14 day antibiotic treatment. What started as seven days became ten, and now, we are up to fourteen days. Until now. Now, we are at a point where I can no longer ignore the logistics. The reality of the "details" is that Tom only has one more vacation day off of work (we used a lot of his time off in October when we traveled out for the other possible adoption.) The girls have missed more than enough school and they are all having a hard time understanding why kids under ten are not allowed to visit the NICU. They met the baby yesterday for the first time, very briefly, after an emotional appeal to the day nurse. It was a shock to see how many "five kids" really looks like. But, it was such a relief to have all my babies in one place for the first time. This poor baby boy just continues to have new medical issues arise daily. It is very hard because on top of the legal and emotional piece with the actual adoption, and the logistical issues with Tom's vacation time being up and the kids getting back to school... We have this thick, underlying layer of the baby's health. Even if all the other layers are peeled back, we still need to be here another ten days at the minimum. They are now concerned with his kidney function. His hearing seems fine to me, so I think that concern can be checked off. They are still treating the infection and the main focus is his eyes and kidneys now. We just received news that the we got the required signature to take care of the legal matter of the birthfather. Tomorrow, N. is scheduled to meet with a legal team to sign surrenders and at that point we will do a special placement ceremony where she will finally meet all of our kids. Marlie in particular has most wanted to meet miss N. or Aunt N---- as they will call her. Tom picked up N. and is on his way to the hospital now. This will be the first time she has seen the baby since she was discharged, as she felt that having less contact with him would be best for her to start processing it all. We will have a brief reunion together and then the social worker will me to discuss all the plans. If all goes according to plan, Tom, Annalee and Marlie are going home on Tuesday to return to regular schedule of work and school. My mom will take the Harper and London to Michigan, where my sister (Kristin) will watch them and they can get back to their regular schedule of bossing each other and peeing the bed. 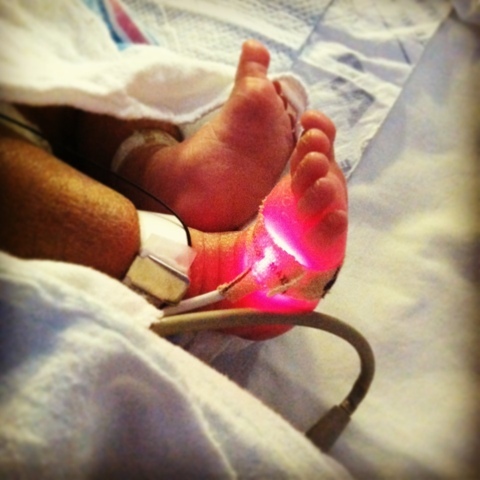 My other sister (BethAnn) is flying to NYC on Thursday to be with me here, so I can have occasional breaks from the NICU. I know this post is not deep or flowery, but logistics never are. I want to thank so many of you who have offered support, encouragement and prayers. I wish I had time to update people individually... But there is simply no time. Reception is spotty and texts am pictures seem to only go through to iPhones. Regarding the name and pictures so many have requested, we are just waiting until thing are a little more official, just to be respectful. I promise, nobody wants to pump you with pictures of his sweet face more than me! Thanks again to all of you who have lifted our family in your prayers. Please keep them coming. Having faith the the Lord's will will be done here is really all we have going for us here.